Nick Cowap won on Ferry Meadows. The big bream shoals at Ferry Meadows have yet to show in numbers and for those fishing round three of the Peterborough & DAA/Ringers Series only 15lb was needed to qualify for the grand final later in the year. Everyone was hoping for some cloud cover at the very least but with the hot, sunny conditions still with us anglers found it tough going. Leading the way from peg 67 was Nick Cowap, who fished a feeder at long range with a worm and caster cocktail to put a very respectable 42lb 14oz to the scales. 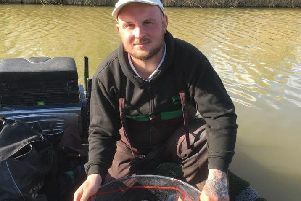 On the next peg was Steve Maher, who had 23lb 5oz, then came Lee Jepson over on peg 47 with 20lb 15oz. The North Bank on the River Nene will be hosting an Angling Trust National later in the year so will come in for quite a bit of attention from visiting anglers over the next few weeks. The venue had its first big test of the season at the weekend when holding a Riverfest Qualifier there with the top three anglers going through to the final on the River Severn. While quite a few anglers decided to fish a feeder approach, matchwinner Lee Edwards decided on a long pole approach from peg 16 in A section. He potted in groundbait laced with casters and worm, fishing a heavy float and a relatively light elastic. His tactics worked to perfection as he put a fine 55lb 13oz to the scales. Second from peg 21 in zone B was Charlie Gooch, who fished similiar tactics to the winner to finish on 25lb 4oz followed by Martin Caldecott with 18lb 2oz taken on a feeder approach. There hasn’t been a club match on the River Nene at Orton Upstream for some time now but the Castaways club match there on Sunday proved there are still fish to be caught above the lock and once we get some water going through the system I am sure weights will improve dramatically. First place went to the consistent Paul Dotchin fishing the pole and feeder and catching 4lb 3oz of roach and perch on a worm and maggot approach throughout the day. Mel Saggers and Neil Beeby both had 2lb 14oz to share second place. Ramsey & District AS fished the Black Mill on the Old Nene at Ramsey St Mary’s in their running line only match. Top rod with a very good 21lb 11oz from peg five was Harry Young. He fished a waggler netting four tench and a bream, his best tench weighing in at 5lb 13oz. Vern Edgley had four bream from the next peg to take second place with 15lb 14oz, then came Keiran Payne on 6lb 7oz and Mike Mohan with 4lb 14oz.